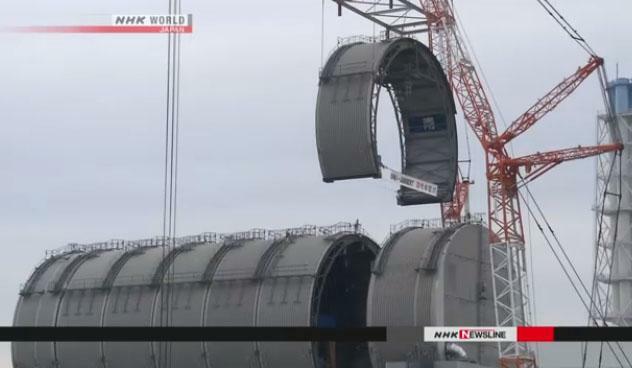 In what the Japanese press heralds as an important step to safely removing all the radioactive material left inside the Fukushima-Daiichi nuclear power plant's ruined reactors, the Japanese utility in charge of cleaning up the site has finished installing a roof over reactor No. 3. The work started last August to set up a dome-shaped cover. It is part of preparations for removing nuclear fuel from the reactor's storage pool. A total of 566 spent and unused fuel units remain in the storage pool of the No. 3 reactor. On Wednesday, workers installed the last part of the cover, which is 17 meters high and 22 meters wide, and weighs 55 tons. Tepco, which ran the plant and also criminally lied and obscured the full extent of the radioactive leakage caused by the disaster, is scrambling to accomplish as much as possible ahead of the 2020 Summer Olympics in Tokyo. Cleanup of the power plant's crippled reactors - which experienced meltdowns when a tsunami thrashed the Japanese coast back in 2011 - is expected to take decades. More recently, Tepco has been criticized for draining what it described as "harmless" radioactive material into the water near the plant - sparking outraged local fishermen to fight back. Last year, the Japanese government started cutting benefits for people who were forced to flee their homes and possessions because of the disaster. This has forced some people to move back to the exclusion zone for the first time since the initial evacuation. Photos of the area depict a nightmarish ghost town overrun by radioactive wild boars. it is unclear what the true radiation level is in the zone, as none of the government's data are reliable or credible. Which is why - while modest - adding a roof on top of the Fukushima sarcophagus is welcome news for the locals as it will then allow Tepco to remove hundreds of units of nuclear fuel from the reactor's storage pool, which will begin this fall. The other reactors will be treated afterward. The roof will prevent radiation from spreading, while also protecting the plant from wind. Tepco says it’s still working to remove rubble from the ruined reactors.